When a philosophy works, its followers have work also. The ad in Miami-area newspapers promised eighteen construction jobs at a site in Coral Gables. Two hundred hopeful unemployed workers rushed that morning to the address, which turned out to be a vacant lot. In this era of rising unemployment, it is common to see hundreds of people lining up at the doors of companies offering a few jobs—and those who don’t get those jobs often wind up at the doors of other institutions, namely our hospitals and prisons. Sociologist M. Harvey Brenner of Johns Hopkins University studied the effects of unemployment and found that a 1% increase in the national jobless rate coincides with a 4.1% increase in suicides and a 3.4% increase in admissions to state mental hospitals. Prison populations also increase, rising 4%, and police records show a 5.7% increase in the homicide rate. This same principle is expressed in the Bhagavad-gita, the book containing the essence of ancient India’s Vedic knowledge. There Lord Krsna, the Supreme Personality of Godhead, says, “No one can refrain from doing something, even for a moment. “It is the nature of the living being always to be active. Even during sleep, when the physical body is inactive, the mind remains actively working in dreams. Therefore Lord Krsna says, “Action is better than inaction.” Everyone must work. He further states, “A man cannot even maintain his physical body without work.” Nor can one maintain the bodies of those who depend on him, his family members. So work is a social necessity as well as a fundamental activity of consciousness itself. 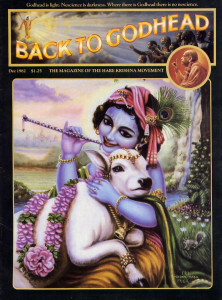 Krsna gives an outline of such rational social planning in the Bhagavad-gita, where He says, “The four divisions of human society were created by Me.” He describes the four social divisions as the intellectuals and priests (brahmanas), the administrators and military men (ksatriyas), the businessmen and farmers (vaisyas), and the laborers and artisans (sudras). No society on earth is without these four classes. They are not artificial castes but natural divisions growing out of people’s varied physical and mental characteristics. Even in communist countries, which strive for a classless society, intellectuals naturally rise to prominence, as do professional administrators and military men (the so-called New Class). Most communist countries have also had to make allowances for some private business and farming. But who should organize society so that these four classes are fully and harmoniously employed? In the Vedic social system the task of properly organizing society fell squarely upon the shoulders of the administrative class, who were advised by the intellectuals and priests. The first duty of the chief executive was to see that every citizen was working according to his natural ability. If there was any unemployment whatsoever, everyone knew where to place the blame and where to turn for help. The government leaders took full responsibility. “Dear King Prthu, just as a tree with a fire in the hollow of its trunk gradually burns up, we are burning up because of the fire of hunger in our stomachs. You are the protector of surrendered souls, and you have been appointed to give employment to us. You can give us all kinds of occupational engagements, for you are the master of our livelihood.” In response to the pleas of his subjects. King Prthu took immediate action. So it seems there is some substance to the charge by liberals in the American government that President Reagan is cold and callous toward the millions of his unemployed countrymen. But we must remind liberals and conservatives alike that jobs alone are not sufficient to insure a peaceful and harmonious society. Even in times of relatively full employment, there are plenty of economic problems and labor strife. And workers in all types of jobs, from the assembly line to the boardroom, are always disgruntled about the kind of work that economic necessity forces them to do. Of course, if the transcendental, divine order of things is only “dimly descried,” it can hardly serve as a basis for organizing society. In the Vedic system of government, that divine plan is brought into distinct focus and made central to the daily lives of all the citizens. For one who is not aware of his deeper spiritual nature and who doesn’t know how to make his work an expression of that nature, work can’t be anything but drudgery, a means to satisfy his own desires or meet the demands placed upon him by family and society. Only a person who understands the true nature of the self can actually enjoy work. What is the nature of the self? The Vedas explain that every living being is an eternal loving servant of the Supreme Lord, Krsna. When we learn how to work in that position, we become satisfied spiritually as well as materially. We experience our inherent qualities of eternality, full knowledge, and ever-increasing transcendental pleasure, a pleasure that makes the highest material pleasures seem insignificant. The International Society for Krishna Consciousness has been organized to give everyone the opportunity to learn the actual art of all work—devotional service to Lord Krsna. This is real employment, and this work has one great advantage over ordinary work: there’s always plenty to do for Krsna, both here and in the spiritual world—so you can forget about unemployment, eternally.